Renault Sport Racing has announced that Marta García and Christian Lundgaard have joined the Renault Sport Academy for 2017. Spaniard García, 16, finished fourth in the 2016 European CIK-FIA OK Championship and ninth in WSK OK Super Masters in 2016. She won the 2015 CIK-FIA Academy Trophy. Dane Lundgaard, 15, finished third in the WSK Champions Cup last year. He is the 2015 CIK-FIA KFJ European Championship winner and 2015 Winter Cup OKJ winner. García will contest the F4 Spanish Championship this season while Lundgaard will compete in the SMP F4 NEZ Championship, both drivers racing for MP Motorsport. "We are happy to welcome Marta and Christian to the Renault Sport Academy for 2017," said Cyril Abiteboul, Managing Director, Renault Sport Racing. "In combination with Jack, Max, Jarno and Sun we have a very exciting line-up of young drivers, highlighting that our focus is very much on the future. "Marta and Christian are amongst the most exciting talents emerging from the karting scene. Like their fellow Academy members, their selection and their retention is based on their outstanding results and potential. Renault Sport Racing is committed to growing its own talent and we will monitor the progress of Marta and Christian with great anticipation." 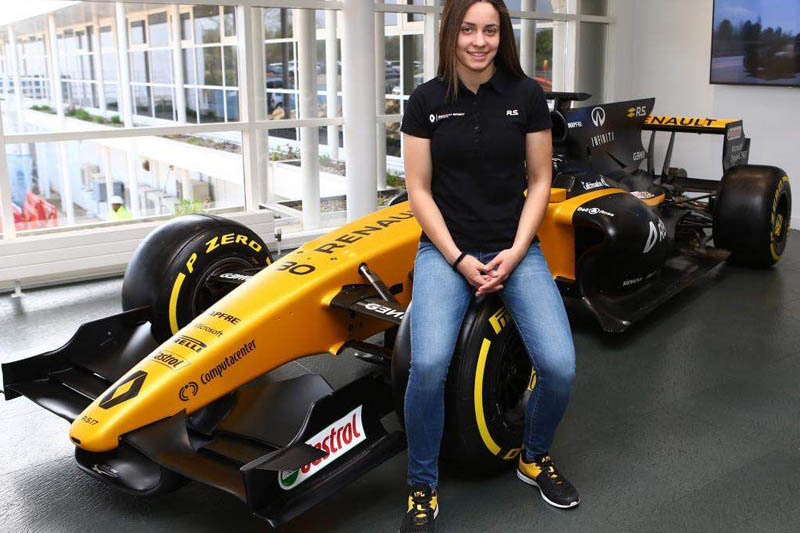 "It's a great opportunity and honour to join the Renault Sport Academy," said Garcia. "I'm looking forward to working with the team throughout the season. Being in such a professional environment will undoubtedly be key to my development and progress going forward and I know the coaching and assistance will help me prepare for my season ahead in Spanish Formula 4." "I'd like to thank Renault and the Renault Sport Academy for this opportunity," added Lundgaard. "It feels great already to be part of the programme. This year is key for me as it will be my first season in single-seaters after karting. The Renault Sport Academy will help me prepare physically and mentally for this new challenge ahead and it feels fantastic to have such support from the team involved." The Renault Sport Academy was started in 2016 to continue Renault's heritage of developing young driver talent and is tasked with finding future Renault Sport Formula 1 World Champions. It utilises Renault Sport Racing's various platforms and global motorsport structures in its quest to nurture new talent, involving the local Renault markets in seeking new drivers from their regions. Renault has an impressive record of finding the F1 stars of the future, with the likes of Robert Kubica, Lucas di Grassi, Pastor Maldonado, Heikki Kovalainen, Jerome d'Ambrosio and Romain Grosjean being nurtured through previous Renault driver development programmes.